Just a few days ago another 1911 arrived at my door. This one from the good folks at Colt Firearms. 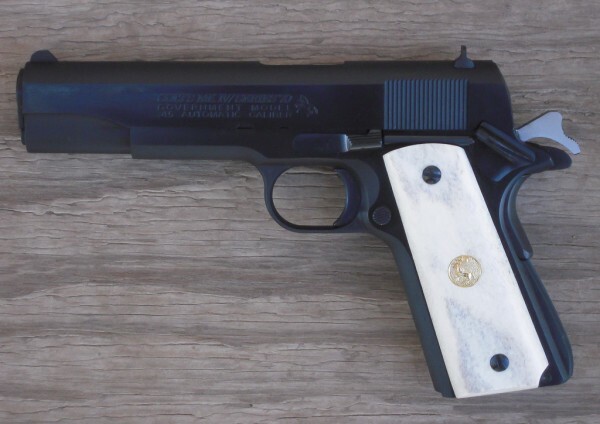 It is their current production Series 70 Government Model, in .45 ACP. To say that I am glad to see Colt producing the Series 70 guns is an understatement. I am not a fan of the firing-pin safeties that are being incorporated in many of the new 1911’s and this gun simply doesn’t have one. Years of service have shown us that the 1911 doesn’t need such a safety. And, in fact, it is just another moving part that could, possibly, go wrong. But the current Series 70 guns are a bit different from the originals. The first Series 70 guns had a collet barrel bushing that was designed to lock the barrel up tighter and improve the pistol’s accuracy. Unfortunately, there were also reports of the collets breaking and when they did it just about took a gunsmith to take the gun apart and replace the bushing. The other fault of the original Series 70 guns were the small military sights. I am pleased to report that the new Series 70 Colts have a solid, conventional barrel bushing and high-visibility fixed sights. In addition, this pistol has a very nice trigger. I don’t have a trigger-pull gauge, but I would say that this one breaks at about 3 ½ pounds. And it breaks clean. I have to say that it is one of the nicest triggers that I’ve seen on a production 1911, of any kind, in recent times. I also like the fact that the Colt Series 70 has a short trigger and an arched mainspring housing. This is what I grew up with and am most used to. Of course, the nice thing about a 1911 is that, if you don’t like some of the parts, you can always change them out. The stocks, by the way did not come from Colt. They are smooth elkhorn stocks, with the Colt medallion, from Grashorns Gun Works. I got these at the same time that I got the Dall sheep stocks for my lightweight .38 Super. Initial testing indicates that this is a reliable, no-nonsense 1911. And I am sure looking forward to putting many more rounds downrange with it. In fact, this one will probably not go back to Colt. I’m pretty sure it’s found a home in Texas. This entry was posted in Gear, Guns, Semi-Auto and tagged .45 ACP, 1911, colt, firing pin safety, Grashorns Gun Works, gunsmithing, Series 70, texas. Bookmark the permalink. Nice Colt. Now tell us about that LW in .38 Super!